Holy Land - A-Nox Mask designed to treat problematic and oily skin. The mask refreshes the skin, removes dead skin cells and reduces its oiliness. Absorbs excess sebum, helps to exfoliate the skin's upper layer and the elimination of hyperkeratosis. A-Nox Mask preventing infections in the presence of micro-cracks in the skin, wounds, abrasions. It accelerates the healing of skin damage. It relieves swelling and irritation. Aligns the texture and color of the skin. Apply the mask on cleansed face, chest or neck with a sponge and rinse after 15-20 minutes. Use 2-3 times a week. 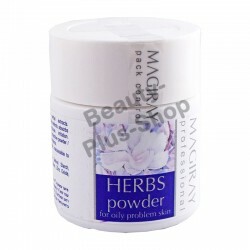 Natural antiseptic powder based on carrageenan, a natural antibacterial agent, effectively removes i..